Vue life from a new perspective, one of comfort, performance and design. Vue chairs are the ultimate in task seating. Rated for 24/7 use, the mesh back has ample support and ergonomic shaping to provide all day comfort and prevent fatigue. The breathability of the mesh keeps you cool and comfortable throughout every workday no matter how many hours you put in. 500 lb. weight capacity. 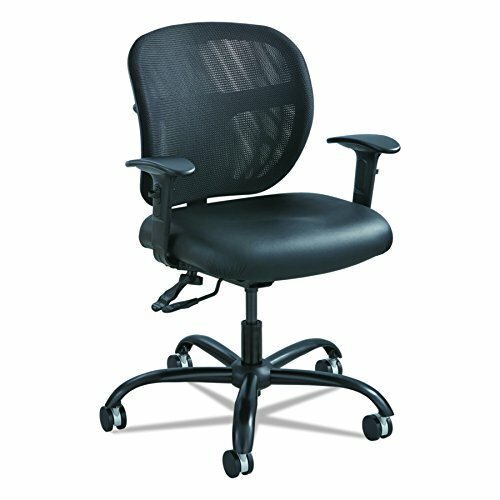 Reinforced mechanism with pneumatic seat height adjustment 17 1/2" to 20 1/2", 360 degree swivel, tilt adjust with tilt tension and tilt lock, back height adjustment. Heavy duty five star steel base with 2 1/2" dual wheel carpet casters. Optional Safco Products Adjustable T-Pad Arms Model 3399BL available (sold separately). Vue intensive use big and tall swivel task chair with weight capacity up to 500 lbs.